No, no it was not all that bad, the passing year, however as we are going towards the end of it, I would like to talk about the custom of year-end parties in Japan, which are the so called BOUNENKAI (忘年会・ぼうねんかい). It is yet another and last occasion of the year for the festive people of Japan to throw their parties. The country has a vibrant festival culture, but unlike many seasonal events, bounenkai has no religious connotation or specific event protocol what so ever. Nonetheless, it can be said that it still carries a not unimportant social relevance and therefore is not to be missed out. A picture taken in the vicinity of Nagoya Castle, Aichi Prefecture. 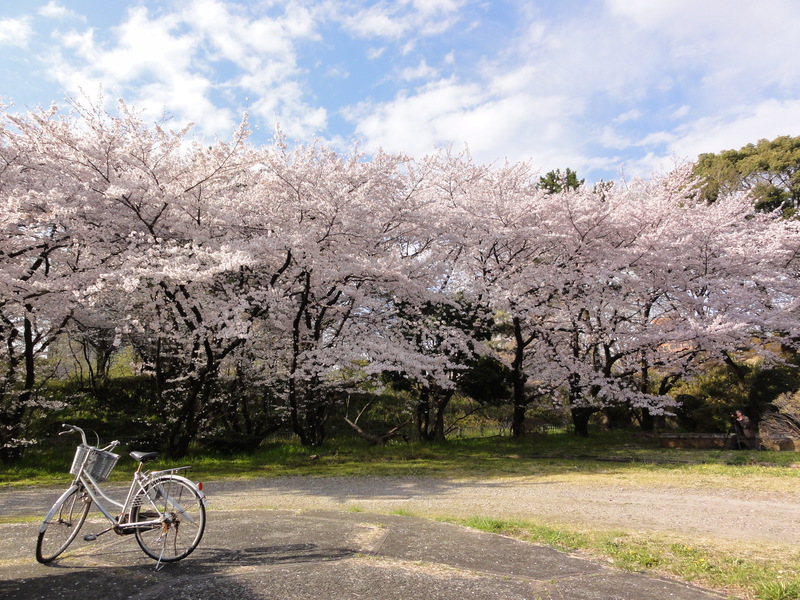 The bike abandoned in the front, a photographer taking aim in the shade of the cherry trees in the background. All this on a sunny day. One of my personal favorites. As the warm winds blow in to lift the veil of dullness that winter imposed on everything, the newly inhaled life invigorates humans and nature alike. A feeling of encouragement and zest holds sway, things are on the move. In Japan this sentiment is emphasized by the fact that spring often marks the end and the beginning of terms. Students graduate or change schools (卒業; そつぎょう and 転校; てんこう respectively), businesses welcome new employees or rotate roles (incl. 転勤 tenkin, job relocation within the firm to other prefectures or even countries), others search for new housing (引っ越し; ひっこし). Thus, the period may be considered as a time of transitions to the unfamiliar, but also goodbyes to established habits.